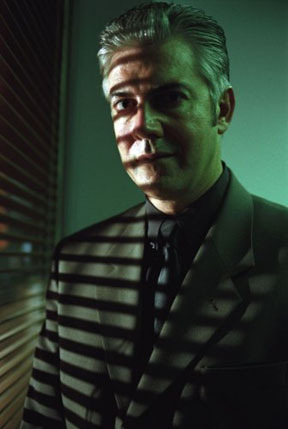 Shaun in The 13th House – Shaun Micallef Online! Shaun’s been involved in a number of side projects through the years, some of which have had limited releases, making it difficult for fans to catch them. One such project is The 13th House, a 2003 60 minute film which formed part of the official selection in the Adelaide Film Festival 2003, Sitges International Festival of Catalonia 2003, Brussels International Film Festival 2004 and the Sydney Film Festival 2003. Mark Waterman (Damon Gameau) works a menial job writing travel brochures for a large, faceless corporation. He is just another cog in an impossibly large machine; dreaming of holidays he can never afford and women he can never have. When an opportunity for promotion to the 13th Floor is presented to him by the enigmatic Chairman of the Board, played by Shaun, Mark quickly jumps at it. The lure of the most expensive cars, tailored suits and other perks of the ‘better life’ await those that attain membership to the Board. Finally, the the film is finally available on DVD, and includes special features such as deleted scenes and outtakes with Shaun. Purchase it at the Triptych Pictures website.